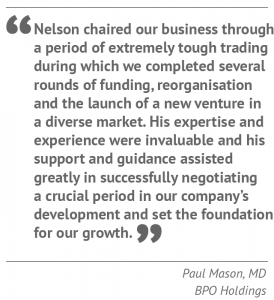 Nelson has assisted a range of boards, entrepreneurs and executive teams build value within their companies. These have included owner managed and family businesses and those with external bank, venture and Angel funding. His background as an accountant turned business owner before moving into Angel and Venture Capital investing helps bring a ‘time-served’ understanding of both sides of the investment relationship. Understanding valuation and preparing yourself for Due Diligence process to avoid falling at the final hurdle. Mentor to the principals and board advisor. Turnover £4 m. Critical Issues – Reorganisation of board from joint to single managing director while retaining both directors (sales and production) within the business. 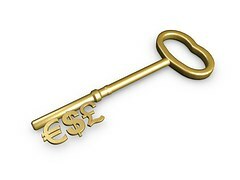 Introduction of improved financial controls, management information and costing systems. Major customers included Compass, Co-op. Tesco and Costa. Turnover £50 million. Critical Issues – Restructuring the company from a manufacturing company to a technology based supply chain management company, with extraction of significant value for shareholders. Two manufacturing units sold to AIM plc for £11 million and a third to a MBO. Group turnover reduced to £25m, profits increased. Turnover £4 million. Critical Issues – Turnaround from loss making to profit. Refocusing the company to profitable clients. Restructuring of group to protect shareholder value. Diversification of business operations to reduce risk. Exit by MBO of all third party investors, subsequent trade sale by management. Operations in UK, Ireland and Hong Kong. Turnover £12m. Critical Issues – Mentoring of owner- manager, preparation of company for sale. Improvement of financial and management information to demonstrate value to potential acquirers. Maintaining cash flow, profitability and customer service during exceptional high growth (turnover increased by 100%) in final year before sale.